Thanks to its temperate climate and beautiful landscape, Positano has been the ideal place for a holiday since ancient times. The characteristic `scalinate` (stairways) that from the upper part of the town lead down towards the lower part and the beach. 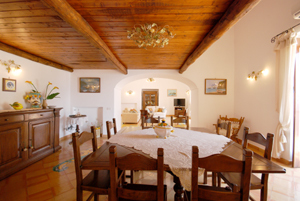 Casa Le Fragole is located on one of the town`s typical terracings that directly overlooks the famous Grande Beach. From the terrace you can enjoy a spectacular view of Positano: the colored houses, the gardens, the sea and the characteristic restaurants that run alongside the beach, all lie below it and in the middle of this view stands the imposing cathedral with its splendid dome covered in precious Amalfi ceramic tiles. Casa Le Fragole is a luxurious apartment made up of a living-room which extends for almost the entire length of the house with large windows that overlook the panoramic terrace. It has been completely renovated in a manner that has preserved its typical Mediterranean style: the terracotta tiled floors are embellished with prestigious ceramic decorations,and the terrace,which extends for almost the entire length of the house is equipped with a table ideal for outdoor dining and a deck chair, perfect for enjoying the panorama of Positano and the sea. Casa Le Fragole is equipped with all the modern comforts: A.C. in all the rooms, Wireless Internet in all the rooms (free), a safe, a CD player, dishwasher and microwave. The beach is about 300 m away, which you access by means of approx. 250 steps. The main beaches of Positano are the Spiaggia Grande and the Fornillo Beach, both of which you can walk to; the others are Porta, Arienzo and San Pietro Laurito, all of which are accessed from the sea. Positano has various public transport services and there is no need to have a car. (Accessed from 82 stairs) GROUND FLOOR: living-room with TV, dining room with access to the panoramic terrace with sea view, kitchen; 2 double bedrooms both with an additional third bed (single), one of which with panoramic view; 2 bathrooms with bathtub-shower, 1 bathroom with shower, laundry room with washing machine, dryer and laundry tub. FIRST FLOOR: spacious loft overlooking the living-room, with 3 single beds and panoramic view, 1 bathroom WC. Other services included in the price: Wi-fi Internet connection, 1 beach town per person for the holiday period. Paid on site in cash: ELECTRICITY is included in the rental price up to a maximum consumption of 100 KW a week, the exceeding KWs must be paid for on location at a price of €0.30 per KW. - PORTER service on request and to be paid for on location.